We are huge Fisher Price fans in the Innocent Charms Chats family and we don’t hide this, we already have a Fisher Price Projection Mobile which Grayson got from his Pop’s when he was 1st born, we had wanted to move this onto Addison’s cot as it includes a mobile but due to Grayson loving what we call his “pictures” before bed we hadn’t been able to do so, so when we were sent the Discover & Grow Story Book Projector to review from Fisher Price we thought our problems were solved. 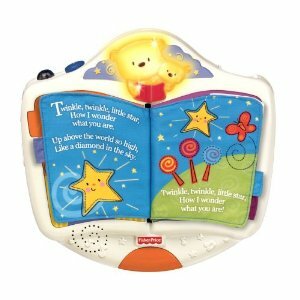 Basic Description of the Fisher Price Discover & Grow Story Book Projector. So initially the Projector was put onto Grayson’s bed, its simple to install, just a couple of batteries and then you clip it onto the bed, even I can do it. We had hoped that the story and music would relax him to sleep whilst he watched the image on the ceiling, what we hadn’t realised was the pictures are completely static and flick between 2 images per story, Grayson’s Projector Fisher-Price Precious Planet 2-in-1 Projection Cot Mobile has moving pictures that project onto the ceiling and heartbeat sounds to soothe him to sleep. We tried for over 2 weeks to get Grayson interested in the Storybook, he did not like that the pictures didn’t move and although he could sit up and touch the unit the concept of turning the pages was too complex for Grayson. We thought all was lost, then one day whilst I was at work the hubby decided to swap the projectors over (as to be honest Addy had not been interested in the mobile part), Grayson was pleased to have his unit back and instant smiles appeared, but how would Addison get one with the Storybook Projector. Well she loved it, unlike Grayson she liked the fact the picture was static, it did not seem to bother her at the young age of 6 months, she likes the story aspect but when the lady sings and then plays classical music she smiles with delight (the lady has a very calming voice), she also loves the fact that the little Teddy lights up as a night light whilst it’s on and lays there and strokes it. There are 4 stories, including my favourite Twinkle Twinkle Little Star, the unit attaches to the cot incredibly securely and I have no fear even when Addison bangs it that it will come off, there are no parts which she could choke on or swallow, I can’t wait till she is a little older and can turn the pages herself as this is one of the only downsides that I have to go in the room and change them, but it does continue to play pretty music after each story. I think as proved in this review every child is different, although Grayson from 6 months took very well to his Fisher Price Projection Mobile and has continued so, Addison did not seem interested in items moving around, they would just keep her awake where as the story book with its more basic features works well for her. I do think Projection units from Fisher Price are fantastic and have kept both my babies happy. Both can be found at the following retailers – Tesco/Amazon and Mothercare. 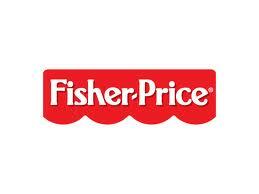 Disclosure – We were sent this item from Fisher Price FOC for our views and opinions.